Looking for a fun gift idea? 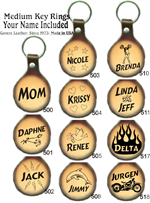 A personalized leather key ring is a great gift that will ensure your keys never get confused with someone else’s. 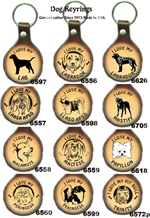 Choose from different styles that each carry their own unique message. 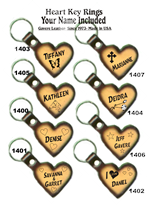 For the dog lover we offer customized key rings that can display the name of your four legged friends, for lovers we have name hearts that can be customized with the name of your sweetheart. 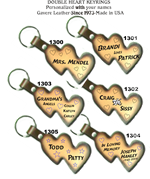 We even offer memorial key chains that can be personalized with a memorial for a loved one. 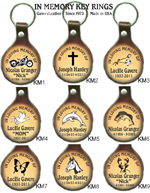 All of our personalized key chains are made from genuine top grain leather and hand made in our High Springs, Florida facility. Because we only use quality materials, you can trust our products to stand up to regular use and abuse. 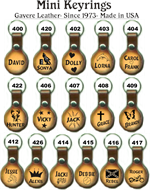 Browse our selection of custom leather key chains below to find the one that best suits your personal style.